The Third Kingsland Irregulars: Does it do that every time? 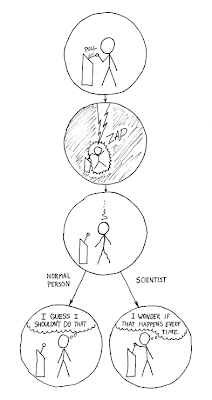 One of my favourite web-comics of all time is xkcd. And one of the best strips that Mr Munroe has ever done, in my humble opinion, is The Difference. Every scientist that I know who has seen it gets it. It's not that the scientist doesn't learn or is about to get zapped again or anything silly like that. One of the tools scientists use these days is repetition. Repetition and the statistics that are generated by repetition can help us see what is actually happening rather than what we think is happening. Or If you have people playing games, you can get a decent idea of how most people would behave under different circumstances. So you don't get blinded to what actually happens (or what would happen) if you get someone who's a little unusual comes along and does exactly what you'd expect them to do. Take the prisoners dilemma I mentioned yesterday for example. When you play it once, weigh out the costs and benefits, it's obvious that the best course of action is to dob your partner in crime in. If the game is played over and over again though a new optimum strategy becomes available. As the two players get to know each other (by their actions, not by getting together and having a wee chat), the players can learn to trust each other and cooperate and remain silent, improving the situation of both players. Then comes the betrayal where knowing that the other player is going to cooperate, allows a player to dob the other in. Seems fairly abstract doesn't it? Until in place of two prisoners you put multiple countries, instead of jail time, you get economic benefits and you replace dobbing each other in say, action on climate change. We have minimal action on climate change in the world today. we have precious few politicians willing to step up and build the trust amongst countries that is needed. Precious few who will even acknowledge the problem. Though I have to say, in at least one aspect Australia is quite lucky. At the same time that it's refreshing to hear a politician front up to the facts, it's depressing that it's notable when one of them does. Anyway. Now we get into pure speculation - why are politicians loath to even attempt to build the trust required for action. I imagine that the cynical amongst us would say that politicians are driven by money from the business world. Which might be true in America, but here in NZ, I don't think that is as true. Certainly not to the same extent. the business world of course is primarily concerned with making more money and any cost from action is a cost that they would have to bear and so the costs are represented as significantly more than they actually are. Another reason that politicians are loath to act I suspect, is that they wish to continue their career in politics. Which is an argument in favour of term limits. Instead of taking action, it is far easier to listen to the received wisdom of the political advisor's who are operating under a common sense set of assumptions that haven't been tested. Like "raising taxes is bad". Gaming and analysis of what transpires allows us to test different sets of conditions. I would suggest that "raising taxes is bad" is something that should be looked at. maybe try testing "under what circumstances is raising taxes bad". Just to see what happens.